Union Park Pizza is now open seven days a week after a ‘soft opening’ that lasted a couple of weeks with limited hours and menu. The husband and wife couple who opened the new pizzeria in the space formerly occupied by Harry O’s received a nice write up in Eater Boston, announcing their soft opening. Effective this week, Union Park Pizza is open until 10PM Monday – Saturday and until 8PM on Sunday. The sparsely decorated pizzeria is a bit sterile looking at the moment. Fortunately, the thin crust pizza is quite good and the restaurant is a welcome addition to the neighborhood. 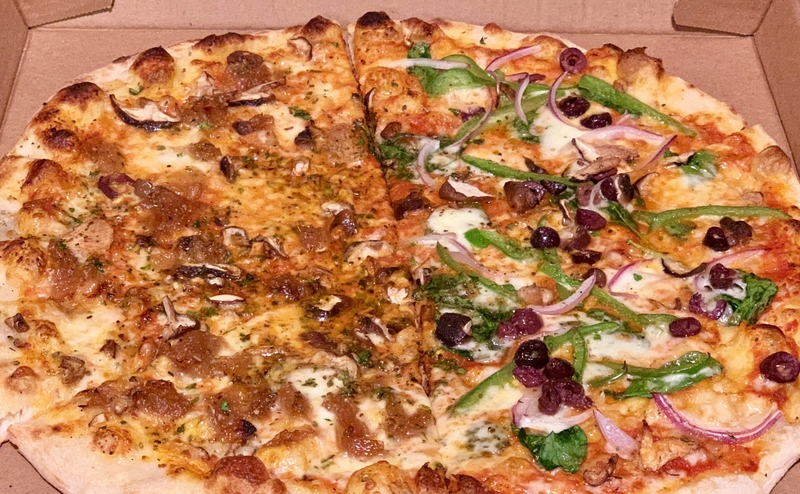 Above is a photo of a large pizza, half Neighborhood (on the left) and half Veggie Supreme (on the right). I was partial to The Neighborhood but I’m curious to hear what you think – give them a try and let me know. BosGuy Rating: 3 out of 5 stars, Good.